This week’s assignment from Kristine was a potpourri of stuff. My entries this week are not too exciting, unfortunately. And I’m posting early because I’m going to see Toad the Wet Sprocket tonight. Yes, I am an 80s junkie. Like, totally. My supplies. These supplies have been in a box for many many months, until I took them out to take a photo of them. Knitting isn’t a popular summer activity, you know? My bag. This is my newest bag. It cost me around $90, but it came with FOUR PAIRS OF SHOES. Actually, the bag was a freebie on DSW’s opening day, but I like to say it cost me 90 bucks. 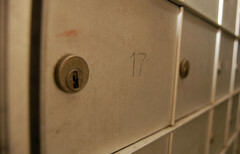 My mail box. I love to come home from work and see what the mail carrier (I’m so PC!) has brought to me. Usually it’s for the people who used to live here. But next Friday is my birthday so there should be some stuff in there for me soon! So, did you play? I wanna see your stuff! You can buy a bag with FOUR pairs of shoes? A bag after my own heart. Oooooh, I love your $90 bag! 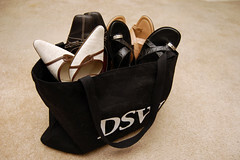 I wish my bags came with shoes! I :heart: DSW. It is deadly, there’s one not 5 minutes away from my house. Hope Toad the Wet Sprocket was excellent! Nice bag! So you got four pairs of shoes for $90?! Good deal!! Man, I love Toad the Wet Sprocket. Love the bag of shoes! Nice pictures. I played too. Oh I so want to learn how to knit, my mom has been wanting to teach me for years! 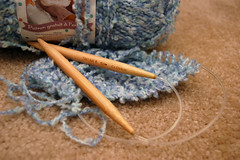 I never thought of taking a pic of my knitting supplies! I’m a summer knitter, btw. Your DSW bag is like my husbands Matco Jacket, that Jacket cost me $4000 7 years ago. It came with a barney purple tool box. My mom knits, some of the stuff she comes out with I have to remember is from the heart. Great pics!! The bag photo got me all excited! A new DSW is opening near my office. I wonder if I can get a bag too?! Any bag that comes with four pairs of shoes is AWESOME! A free bag filled with shoes! That is like a dream! Totally, just a crack at the concert you are going to. Have fun. I like them too. These posts of yours always tempts me to play too.